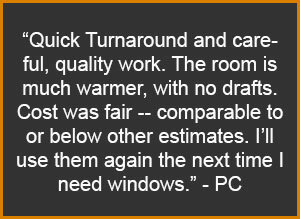 When faced with a window replacement project, deciding on the type and features you want (and need) can be quite daunting. Window technology has come along way over the last few decades, featuring a few more working parts then simply just wood and glass. Today we are going to provide a brief overview of window replacement terminology and language, in order to help you understand exactly what you are getting. A measurement that signifies the amount of air that can escape through cracks or gaps in the window spacing. Windows with a lower AL rating will allow less air to escape. The type of gas injected in between double pane windows. Argon gas helps increase the insulative benefits of the window. Refers to a style of window popularized by early colonial homes that divides a pane of glass into smaller, individual panes of glass using muntin bars. There are two types of divided line windows: True Divided Lites (windows or window panes actually separated by the muntin bars) and Simulated Divided Lites (a larger single pane of glass with the muntin bar grilles placed on the exterior or interior of the glass). The act of installing glass into windows or doors in the home. The glazing bead is a strip of wood or vinyl that is utilized to hold the pane of glass in the stationary casing separate from the frame itself. Removable wood or vinyl dividers placed on a single pane of glass in order to give the window the effect of having divided lites. Also known as security glass, this type of glass features two sheets of glass fused together with a sheet of plastic in between them. Even if the glass is broken, the plastic will prevent an opening. Low-E, which stands for low emissivity, refers to glass that is coated with a thin, metallic oxide layer that helps keep heat from escaping from the home. It also help reduce heat gain, or the heat that is transmitted from outside in. The trim refers to the interior casing around the window. It acts to cover up and gaps or spacing between the house and the window itself, and can be crafted to be as simple or ornate as desired. A measurement that determines the rate of heat loss (heat that escapes from inside the home) the window allows. If the U-Factor is lower, the better the window will insulate the home.